The ‘ARCHIVES OF MUSIC AND DISCOGRAPHIC RESEARCH CENTRE’ is a resource and documentation center for each form of sound related to history. It is a unique archive developed by only one man, Narendra Shrimali ‘KAMAL’ which has a collection of more than 10,000 Gramophone Records, Tapes and other printed as well as visual material related to music, theatre, cinema, literature and other cultural aspects of almost last one and half century period. This collection is one of the oldest collections of sound recordings in the world. Narendra Shrimali ‘Kamal’ is a well-known Musicologist, Scholar and Archivist of India. He has a remarkable expertise in disc-music analysis. He has written many analytical articles, papers on dicographic analysis and he has been considered as an authority on Indian Theatre Music (particularly Parsi, Urdu, Gujarati and Marathi theatre). He has been involved in preservation and propagation of recorded music since last more than sixteen years. The archive setup by him is a result of his unending efforts and tremendous hard work. Although the archive is still in development process, as far as some resources requirements are concerned, but it has already expanded its activities all around India and even overseas. Many researchers, scholars and students, from India and abroad, of various performing arts, literature etc. have taken the advantage of valuable and rare material of the archive. It has served as an important resource and reference center for many Ph.D. students of India and abroad. Mr. Narendra ‘Kamal’ has also contributed to many audio, visual and theatrical productions from his archive and he himself has produced many such productions. He is regularly organizing listening sessions in Baroda. He has delivered many talks, lectures, and demonstrations in musicology and discography, given judgements in various musical contests and given his expert views/comments in many seminars, conferences. As a whole Narendra ‘Kamal’ and his archive both are the important resources in the field of musicology and discography in particular and Indian culture in general. Narendra Shrimali ‘KAMAL’ is nothing short of a living encyclopaedia of Indian music on Gramophone Records. With a vast personal collection of about 8000 Gramophone Records, hundreds of Cassettes, Spools and rare books etc. 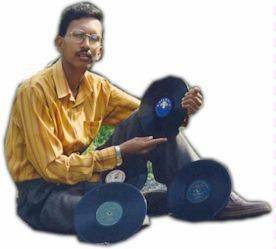 he has the most accurate information on every genre of music that was recorded in last one century in India. This is no mean achievement considering the fact that he is Civil Engineer by study, having Masters degree in Design of Hydraulic Structures with First Class, & is only 30 years old. His collection starts with a record made in the year 1902 – one of the first such record made in India – and includes voices of legendary singers like Miss Gauharjan of Calcutta, Rahimat Khan Huddu Khan (Alias Bhugandharv), Jankibai ‘Chhapanchhuri’, Pyaresaahab, Abdul Karim Khan, Faiyyaz Khan & instrumentalists like Imdad Khan, Inayet Khan, Kumar Prabhatdevji, Pt.Gajanan Rao Joshi, Mohammad Khan etc. He can proudly display records of speeches made by persons like Mahatma Gandhi, Sarojini Naidu, Col.Dhillon of Indian National Army to Cricketer C.K.Naidu. He can speak with authority on the subject of music of Parsi, Urdu, Gujarati and Marathi theatre, on Master Mohan, Balgandharv to Jayshankar ‘Sundari’ to Indian freedom struggle & gramophone records. No wonder that Gangoobai Hungal was deepely impressed when, while visiting Baroda, she listened to her first record cut in early thirties & her Guru Pt. Sawai Gandharv and that Shobha Gurtu Spent nearly two hours in Narendra’s house listening to the music of Bai Sunderabai of Poona, Malkajan of Agra & Roshanara Begum. In 1995 Narendra was invited by the Society of Indian Record Collectors, Bombay to give a talk on Master Vasant of Surat. Society president Mr.Narayan Mulani honored him. His lecture demonstration on Parsi Theatre music was very much appreciated by the mixed audience of ‘Natrang Pratisthan’ & NSD, New Delhi. Then after his lectures were organized by many organizations in Bombay, Delhi & other places. He started Society of Indian Record Collectors (Baroda Chapter) in 1998 and the activity has got significant momentum by this two years. Many national-international daily, Magazines & journals have highlighted his work. Many National/International radio, Television channels like AIR, Delhi Doordarshan DD, BBC, APTN etc. have interviewed him. He has written many research papers on various subjects related to Musicology, Discography & Technical research in field of Civil, Environmental & Hydraulic Engineering and presented it in many conferences. He has conducted many workshops on music and exhibitions of gramophone records. He has written many poetry, various articles on variety of subjects like Theatre, Music, Film, Philosophy, Social problems, Women Liberation, Political Issues, Education etc. He has also given judgement in various music competitions. Recently he has been entrusted work of developing ‘Music Archive’ in faculty of Performing Arts, Maharaja Sayajirao University of Baroda - as an expert of Discography - by the University Vice Chancellor Dr.Anil S.Kane. He was also awarded by national level ‘Majlis’ fellowship for the year 1999 – 2000 to work on Theatre Music.